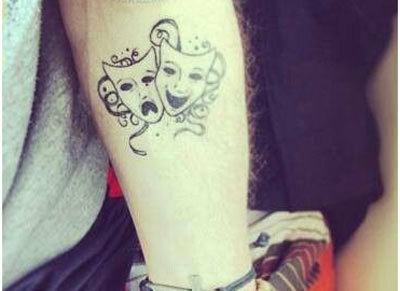 Mask tattoos are usually opted by people who love to have an air of mystery around them, the ones that you don’t usually see opening up to people easily! 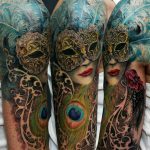 So here is a list of the best mask tattoos from around the world! 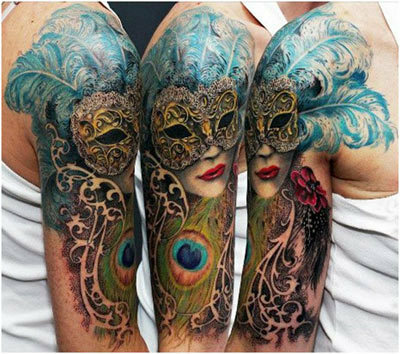 Starting the list with the most beautiful of all tattoos, I am still mesmerized by all the colors and the detailing here. 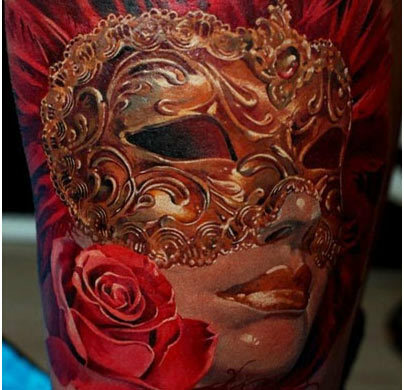 What do you think of the golden mask and the red lips? 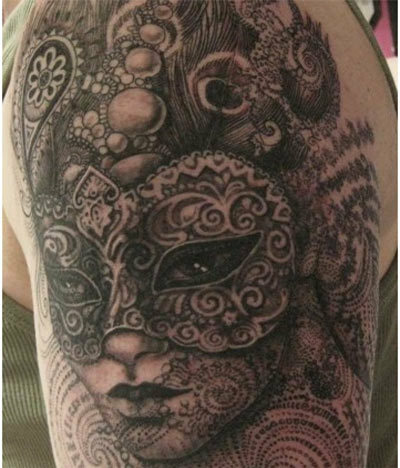 This one is simpler compared to the richness of the mask tattoo design mentioned above. 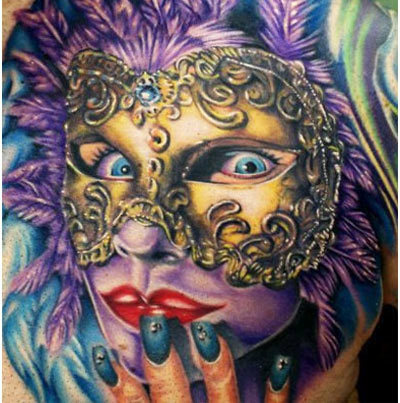 This still has an air of beauty around it – the purple mask with the black intricate detailing is just so fabulous. 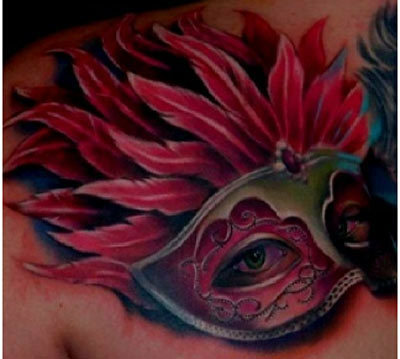 Mostly done with the colors black and grey, this tattoo uses the gradient of colors to make a statement. I love how beautifully the feathers and beads complement each other. Also, the detailing of the eyes is lovely too! This reminds me of a beautiful vampire. 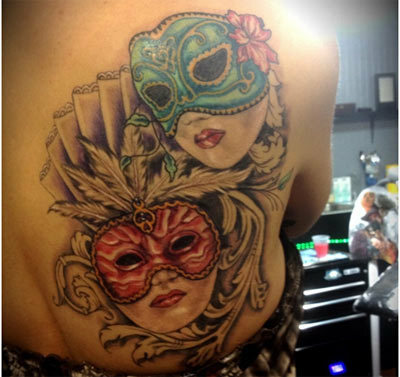 The eyes are hardly existent, but the tattoo still looks beautiful. May be the air of eerie and mystery makes this one super appealing. Even though this is not a complete mask, this is ethereal. The pink feathers add to the beauty of it. This suits women more than the men, in my opinion. 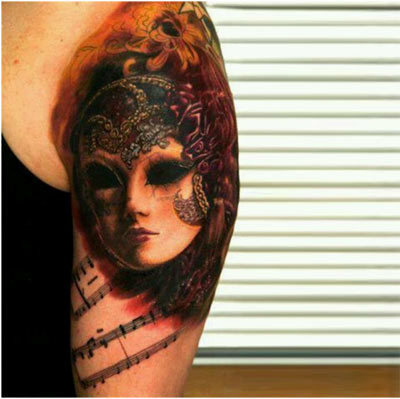 When one mask doesn’t serve the purpose enough, opt for a second one too ;) This tattoo looks unique with its usage of colour. 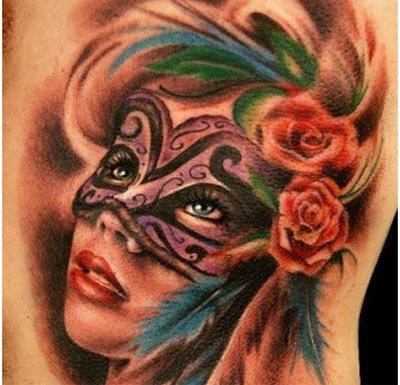 This tattoo has a vintage edge to it. The golden hues, the red feathers with the brown and black detailing definitely make it amazing and interesting. 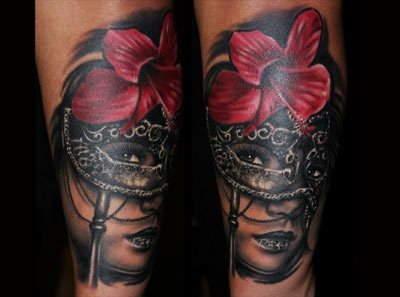 How would you like a mask tattoo with a pretty flower to cover the head? Here you go if that fancies you, the white and the silver make it fantastic and interesting. 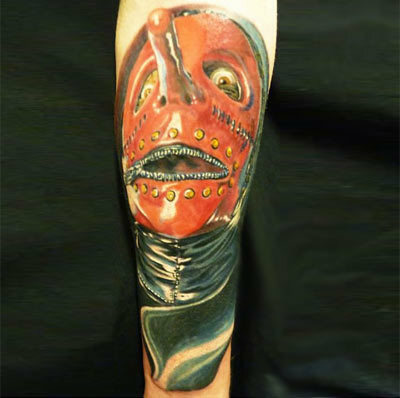 Yet another master piece of a tattoo, this one is a beauty in itself again. I love the flowers, the pearls, and the look of mystery in her eyes. It takes confidence to sport this one! 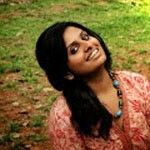 This one focuses on the emotions and it is very well depicted in the eyes of the girl. The mask in itself is vintage and has amazing decoration around it. I love the riot of colors in it. This is a very quirky adaption of the mask. The personality of a person is hidden behind the whole face, rather than just the eye. The zips on either side of the face and on the lips make it very interesting. 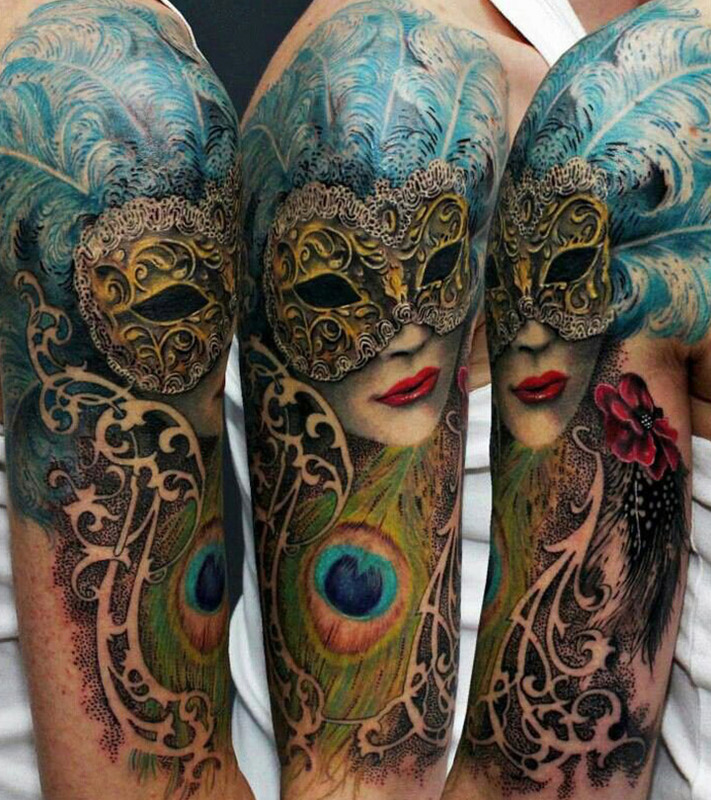 This tattoo uses colors of the same family to create the element of surprise and mystery. A lot of importance is given to detailing; you can observe the nail art on the fingers, the curve of the eye lashes and the gems in the mask. This is more of a modern adaption of a mask. The girl has a retro cap on her, has ginger hair and smokey blue eye make up! There is an excess of blush, a bow and the gloves are jeweled too! 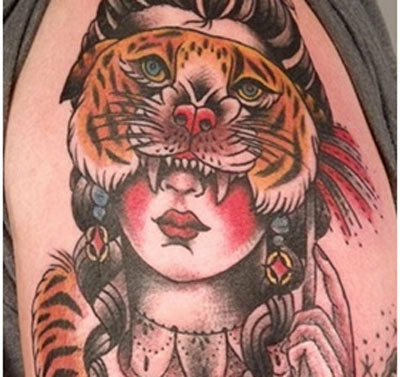 This is a very interesting adaption of a tattoo – the tiger for a mask shows how the innocence and purity is hiding behind a mask of strength and fierce nature. This makes it to the quirky and witty list of masks. 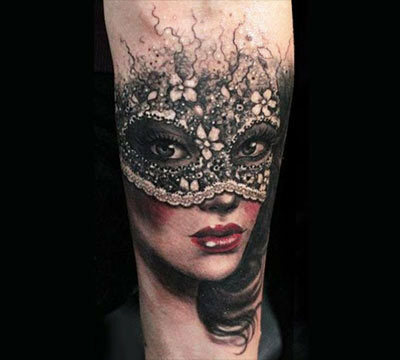 A very common yet overlooked concept, this mask tattoo will definitely make you seem special. So girls, these are our picks! What are yours? Shoot a comment and let us know! 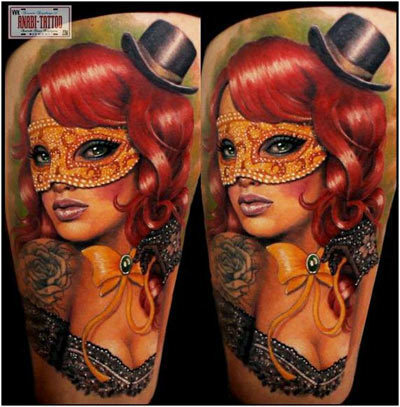 Find more fascinating tattoo designs to pick the best idea for you.